﻿ Will Indonesian Fires Spark Reform of Rogue Forest Sector? Will Indonesian Fires Spark Reform of Rogue Forest Sector? The original version of this article, by Lisa Palmer, appeared on Yale Environment 360. The fires that blazed in Indonesia’s rainforests in 1982 and 1983 came as a shock. The logging industry had embarked on a decades-long pillaging of the country’s woodlands, opening up the canopy and drying out the carbon-rich peat soils. Preceded by an unusually long El Niño-related dry season, the forest fires lasted for months, sending vast clouds of smoke across Southeast Asia. Fifteen years later, in 1997 and 1998, a record El Niño year coincided with continued massive land-use changes in Indonesia, including the wholesale draining of peatlands to plant oil palm and wood pulp plantations. 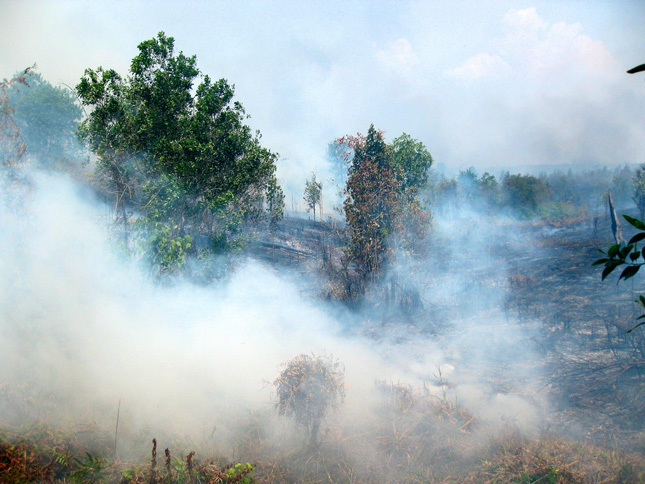 Large areas of Borneo and Sumatra burned, and again Southeast Asians choked on Indonesian smoke. In the ensuing years, Indonesia’s peat and forest fires have become an annual summer occurrence. But this summer and fall, a huge number of conflagrations have broken out as a strong El Niño has led to dry conditions, and deforestation has continued to soar in Indonesia. Over the past several months, roughly 120,000 fires have burned, eliciting sharp protests from Singapore and other nations fed up with breathing the noxious haze from Indonesian blazes. The pall of smoke still drifting over Southeast Asia is the most visible manifestation of decades of disastrous policies in Indonesia’s corrupt forestry and palm oil sectors. Indonesia’s runaway deforestation and draining of peatlands has become a matter of serious concern not only to its neighbors, but also to the global community. In recent years, the country’s land-use changes have made Indonesia the world’s sixth-largest emitter of greenhouse gases, and this year’s fires are likely to propel the country into the top five, behind China, the United States, the European Union, and India. On some days last month, carbon emissions from Indonesia’s peat and forest fires equaled the daily emissions of the entire U.S. economy. Continue reading on Yale Environment 360. Photo Credit: Forest fire in Central Kalimantan, Indonesia, September 2011, courtesy of Rini Sulaiman/Center for International Forestry Research.